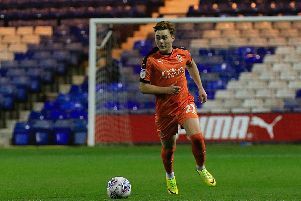 Hatters boss Mick Harford wants Danny Hylton to keep 'playing on the edge' despite admitting he will be having a chat with the striker over the incident that saw him substituted at Plymouth on Saturday. Hylton saw yellow on the half hour for backing into home defender Yann Songo’o, in what looked like a desperately harsh decision from referee Darren Drysdale. Just moments later, the Town attacker was being spoken to again, along with captain Sonny Bradley, by the official, as a grounded Hylton picked the ball up thinking he was about to be awarded a free kick. It meant that Harford had little choice but to replace the striker with Kazenga LuaLua before half time, rather than run the risk of going down to 10 men for an hour, and speaking about the situation today, the Town chief said: “We’re going to have a sit down myself and Danny, we’ll have a chat about it. “Things got put to bed on the way home on the coach, but I thought the first booking was a bit soft, Danny got a little bit frustrated and Danny’s, Danny. “We know what he’s about, he plays on the edge, and it looked like the referee could have done something if he committed another foul, so I thought it was the right decision to take him off and move forward. “That’s the way he plays, he plays on the edge, we all like Danny playing on the edge, I love players who play on the edge, the likes of Roy Keane and people like that. However, although he is well aware that Hylton could be a marked man for officials, Harford doesn't want Town's leading scorer for the last two seasons to dramatically alter his game. He added: “I wouldn’t want to lose his physicality, absolutely not. “The way he backs in, the way he holds the ball up, the way he brings other people into play, I wouldn’t want to lose that from him. “In the last two games he’s played, he started the game, very, very well. “Rochdale, he started the game well, got his goal, Saturday, he started the game well, looked a threat.